A 22-year-old man got married to two women in one wedding. Many thought that the guy was very lucky but no, he was torn between two lovers. 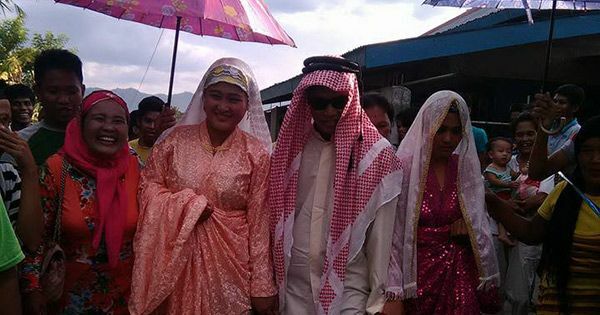 Razul Timbukong, a resident of Barangay Sampao in Lutayan, Sultan Kudarat, exchanged marital vows with Jarah Mendoza Labangin, 20; and Thelma Guipal, 24. According to a report published on the Facebook page of Bombo Radyo Koronadal, Razul and Jarah entered into a relationship and later decided to get married. However, Thelma showed up unexpectedly and claimed that Razul also promised her a wedding. Because of what happened, it was decided that Razul would tie the knot with his two girlfriends at the same time and venue. At first, the unusual wedding was opposed by Jarah's parents, but eventually pushed through as Razul already spent so much when he ask her hand in marriage during the pamanhikan. Meanwhile, Razul could no longer backout from his wedding with Thelma because he would be slapped with a P120,000 fine. The three got married in Muslim rights in the same town on May 5, 2016 and lived together in one roof, but one of them had gone abroad a few days later, according to the report.